More Australian mothers than ever before are giving the thumbs up to Baltic amber teething necklaces for curing more than just a little teething pain. Baltic amber has centuries of history with traditional medicine in Europe, and more recently the use of amber for teething relief has become popular in many other parts of the world, including Australia. How Are Amber Teething Necklaces Made? What Are The Benefits? Many websites have started to pop up promoting the health benefits of amber, specifically for teething babies, offering the necklaces (and anklets) for sale. You can even purchase matching amber necklaces for mum and baby, in colours ranging from buttery yellows to earthy browns. In addition to assisting with reducing pain, drooling (for which amber is said to work by stimulating the thyroid glands) and irritability that is often associated with teething, Baltic amber is believed to help relieve eczema, speed up wound healing and stave off ear and throat inflammation, amongst other ailments. You may assume that babies need to chew on the beads to get relief – but the effects are actually said to come from the beads touching skin, when body heat causes the amber to release succinic acid. The acid isn’t exclusive to amber – its found in many plants and animals. The beads should NOT be chewed at all and the necklace should be short enough so that it cant be placed into the mouth. Are There Any Downsides to Amber Teething Necklaces? There are a few of things to consider about amber teething necklaces. Firstly, although many mothers are finding amber teething necklaces to be effective, not all mothers do. Some report no change after using them. However there are two points to make here – one being to make sure you buy genuine Baltic amber. Some people have reported being sold plastic or glass beads (which was being fobbed off as amber), which would have zero effect. Several amber retailers now offer guarantees and certificates of authenticity to reassure their customers. Another minor consideration is to expect to get a few questions or comments about them, as amber teething necklaces are not yet widely recognised in Australia. Some people may assume the necklaces are an unnecessary accessory for such a young child, just like pierced earrings. In this case, the best thing to do is to compare amber teething necklaces to using copper or magnetic bracelets which people wear for arthritis or pain. Thirdly, those unfamiliar with amber teething necklaces may be concerned with the safety of the necklaces – specifically the choking hazard if they break and the beads fall off. It’s definitely worth a try if you want to give something natural a go, before pharmaceutical gels. There are always other things you can resort to for teething relief if Baltic amber doesn’t work for your baby. Just like any necklace, there is the possibility that it may break if enough force is used, however makers of teething necklaces do their best to ensure their products are as safe as possible, and it is unlikely your baby will have the strength to break it themselves. 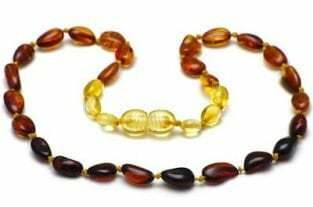 Most amber teething necklaces are made so that the necklace is knotted or double knotted either side of each bead – so if the necklace does happen to break, only one of the very small beads will fall off. Even if the bead is swallowed, amber is non-toxic. Europeans started using amber in traditional medicine long ago. Also, clasps on amber teething necklaces usually consist of a screw clasp for added safety. Because the beads are supposed to sit on the skin and not be chewed, the necklace length is usually short – so they don’t hang down like usual necklaces, which would make them easy to catch on things. Most younger babies don’t even realise its on or go to grab it. Read more of our members think of amber teething necklaces in our teething forum. We have addressed this issue in another article, Amber Teething Necklaces and SIDS. There was a hoax going around the internet (early 2013) about an amber teething necklace causing a case of SIDS. Amber teething necklaces do not cause SIDS – it is simply not true. Babies through Eastern Europe have been wearing them for centuries. The proven biggest increased risk factors for SIDS are unsafe sleeping conditions, if the baby is not breastfed or where the parents are smokers. For more information check out our article on SIDS and SIDS Risks. Make sure you get yourself informed and buy a quality teething necklace – if its cheap or doesn’t reassure you of it’s strength and authenticity (genuine amber, not plastics), its probably worth giving a miss. Looking For An Amber Teething Necklace? Check out the BellyBelly Directory for amber and other teething products here. I’m actually appalled to see an article on this site that is using purely anecdotal evidence to support the use of amber necklaces. Firstly, in order for succinic acid to be released from Amber, it must be heated to near melting point. If your baby’s skin is that hot you will need more than magic crystals to ease the pain. There is NO scientific proof that amber necklaces work. In fact, the risks posed by incorrect use of the necklaces, such as allowing children to sleep in them, far outweighs ANY benefits. Any claims that Amber can cure eczema are even more absurd, as Amber has actually been shown to be a skin irritant! Unbelievable. Thank you for your logical response Sarah! This site should to cease to call itself the “the thinking woman’s website…” if they are going to promote unscientific myths like this. I quite agree. How irresponsible to write that ‘It offers an energy boost and has positive effects for the nervous system and the heart.’ Based on what evidence, BellyBelly? The Australian State governments need to issue a warning about the safety risks of these products immediately. Not only do these products represent a suffocation and strangulation risk, they are also a scam. There is not one jot of evidence (other than anecdotal) to suggest they work to reduce teething discomfort. “Children can choke or strangle themselves when playing with deflated or broken balloons or balloons with strings. Although not dangerous in themselves, balloons can become a hazard when they are deflated, broken or have strings or cords tied to them. * Strangulation after getting the string or cord tied to a balloon caught around the neck. “Pedal bicycles are light, two-wheeled vehicles manually driven by the user pushing on pedals. * Lacerations and limb entrapment if the bicycle is not fitted with a chain guard. At the end of the day, parents can choose to use them or not, that’s up to them. But amber teething necklaces have been used for many, many generations in many cultures. Even more extravagant, non-safety clipping jewellery is used on babies in many tribes and cultures. If you can find documented data about babies dying from strangulation from amber teething necklaces, please share them. Not a death, but sounds like only minutes from one. Also your comparison to riding a bike/playing with balloons is a load of crap. Maybe if we were putting children on bikes and pushing them down streets, or handing them balloons in their cots in the hopes of curing their ailments then your analogy might have some merit. It’s not an analogy, that’s what’s actually on the government’s product safety website! It sounds like a rare event you’ve posted. I have not read it yet. Toddlers and even babies have worn not only safety teething necklaces (some are cheap plastic imitations from overseas, you must keep safety in mind when buying) but if you Google, you will see and read about how many cultures use jewellery on very young children. It’s common sense with safety, and if you don’t feel safe with a necklace, you can get them as bracelets or anklets instead. You’re entitled to your opinion, but if you are actually suggesting people use these because many cultures use/have used jewellery on children, say it is for aesthetic purposes only. I for one won’t be putting an item that even has a rare chance of becoming a choking hazard on my infant child for no discernible benefit, even if plenty of people have done it without any problems. Grown ups can make their own choices, I don’t mind what choice they make. If they read this and decide it’s not for them, then fine, I respect that. It’s all just information, and we can use information to decide if we like something or not. Some people think homebirth is dangerous. Some people think hospital birth is dangerous. Some people think c-section is dangerous. Some people think vaginal birth is scary and damaging. Some procedures we have carry a risk of pregnancy loss — amniocentesis for example, 1% miscarriage (some argue more, since it’s only counted while you’re on the table). Some people get Downs Syndome testing and decide to terminate. Others don’t and may or many not have a Downs Syndrome baby. So many choices when it comes to parenting, but we all define what level of risk we’re willing to take. That’s not for anyone else to judge. I’ve used them without any hassles and know many who have too. We can all decide, that’s the beauty of it all. Someone mentioned that her daughter did not need any medication for her teething because they have the amber bracelet/necklace. Erm.. both my son and my daughter did not need any medication for their teething either. They are not wearing any magic bracelet/necklace/ring etc. Go figure. Oh I love being a new mother. A whole new world of judgement to endure. I have seen deep and superficial friction burns on baby’s necks and ankles. I’ve also seen an anklet cut off the circulation to a baby’s foot which almost required amputation but with extensive treatment (very painful for baby) the baby’s foot was saved. I don’t think amber beads are worth the risk. Looking to traditional practices that have been used for centuries or more in various cultures is valid when combined with common sense and weighing the risks. It’s ultimately a personal choice but I appreciate the info. It drives me nuts to see how dismissive people are because they haven’t gotten that randomized placebo controlled double blind study. If people want to believe in the power of amber necklaces, I don’t see how it harms anyone else. 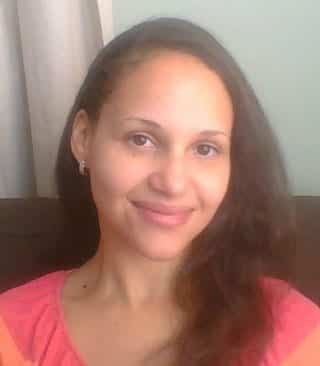 I believe in healing with crystals, others don’t but that’s fine! I think the issue is with a rather unbalanced article. It’s a shame that this is not a more balanced article. If you are going to point out annocdotal evidence in support of Amber then maybe it would be a good idea to discuss the scientific evidence which doesn’t support their use and an explanation why. Eg Amber needs to be heated to 200 plus degrees before it even softens. If it is an ad then you really should state that. These amber necklaces are snake oil in its best form. Utter rubbish as many babies don’t have any trouble with their teeth and those that do, would be better off with a dose of baby panadol!